Bluelips. 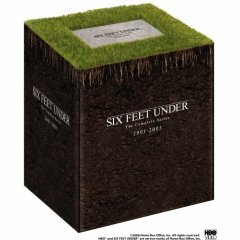 Six Feet Under Complete Series Gift Set-Free Shipping! Relive every minute of Alan Ball's poignantly dramatic, unpredictably hilarious masterpiece, from its powerful premiere episode to its critically-acclaimed, haunting finale. Along with all the episodes and hours of rich bonus features from all five seasons, this set includes two bonus Six Feet Under soundtracks, and an exclusive illustrated booklet with character obituaries and memories from the show's creators. Our price includes Priority shipping AND insurance.